shows a Coal Tank with express headlamps and reporting number 623 leaving a station which he cannot identify (after checking with a couple of other folk before sending in here...). Which station? What carriages? What is the purpose of buldge in middle of side of the first carraige? What is the date? Mystery photo No 5 looks like Hooton, on the LNWR/GWR joint line between Chester and Birkenhead. If so, it’s looking north and the train seems to be heading down the branch to West Kirby. But with express headlamps????? Very strange. Date probably the late 1930s. The shedplate on the smokebox door looks like the 1935 type, but the smokebox door handle still has its wheel; these mostly disappeared during WW2. Yes, it’s Hooton. See photo in ‘The Birkenhead Railway’ by T B Maund (RCTS 2000) p50. Maybe what looks like an ‘express’ headcode was actually some local lamp system on the joint LNW/GW line? I’m guessing, but the left-hand lamp seems to have a dark glass – some colour perhaps? Maybe someone can tell us if there were special headcodes on the West Kirby branch? The only suggestion that I can offer is about the bulge in the side of the first carriage. I have seen similar bulges in more modern stock, for the guard to be able to sit inside the carriage, but be able to look backwards and forwards along the train, presumably to check signals, and also to be able to see that all is OK.
Could this be a special train run in connection with The Open Golf Championship held at West Kirby in 1924, 1930,and 1936? The coaches could have been detached from an express at Chester for the coal tank to take forward. The first carriage appears to have a central guards compartment. Is it ex LNWR? My memories of the West Kirby branch come from a long time ago but (ref Harry Jack’s question of 9 January) I certainly can’t remember any special head-codes. 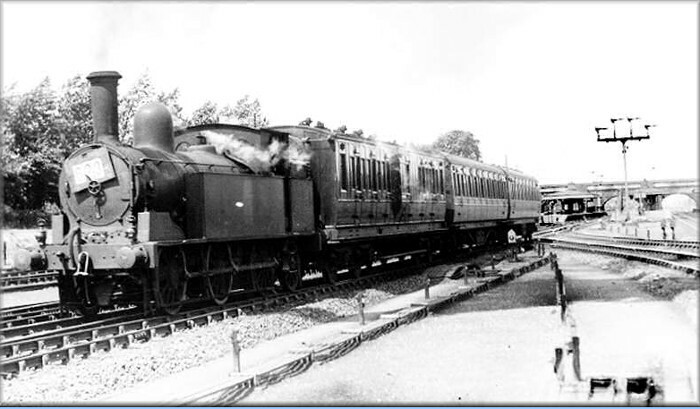 If the photograph is from the 30s, the LMS ran through carriages Euston-New Brighton, detached from the main Birkenhead portion at Hooton, then going by the West Kirby branch and the Wirral line. That New Brighton portion may well have run from Hooton under an express head-code. But are the carriages posh enough for�this through service? The second and third carriages�have elliptical roofs and so perhaps they are. The obvious alternative is a special working – and the Open at Royal Liverpool (Hoylake) is the most likely candidate for a special. Surely the bulge in the first carriage is the guard’s look-out of a 50-foot arc roofed centre-brake . The profile of the second carriage suggests an origin other than the LNWR, perhaps the Midland. This is probably sufficient to place the date after the Grouping. The leading carriage possesses all the LNWR trademarks, including the panelling, prominent torpedo vents and characteristic lamp tops. With its five passenger compartments plus guard's compartment it must be at least a 50ft carriage (bearing in mind the possibility that it is made up of two ex-four-wheelers, meaning 56ft length), yet I am at a loss to identify an official Diagram for it as an arc roof example. The inefficient arrangement of lavatory compartments at both ends of the vehicle is a further surprise! Isn’t the first carriage Diagram 216?�The�plan and side elevation�on pp69 & 70 of David Jenkinson’s “An Illustrated History of LNWR Coaches”�seem to match the carriage in the photo.��He says�60 of them were built in 1900-1, and�gives details of numbering etc in the table on p170. Thanks to Mr Jack’s contribution I was forced to examine the picture more carefully than previously. I can now see the corridor connection which I’d missed. Using this information I’ve also checked Jenkinson, as advised, and would like to offer a slight finesse of Mr Jack’s conclusion. Yes, it is certainly an arc-roof 50ft composite, but rather to Diagram 316. The difference lies in the presence of three panels between the guard’s compartment and the two passenger compartments towards the rear of the carriage in the mystery view. D216 is a first/third brake composite, while D316 is second/third. The extra width of the first class compartments requires a shorter guard’s compartment, and so the vehicle has only two panels between them, as Jenkinson’s drawing shows. The photograph on the facing page (71), however, shows D316 with its three panels, as there are here in the mystery photo. Jenkinson’s photograph shows the corridor side, and we have the compartment side (a useful complement); it is normal practice to replicate the panelling arrangement on each side (although lavatory windows are a different case). There’s a compartment-side photo of a D316 carriage in LNW livery at Euston platform 2 which proves Mr Johnson’s point. It’s No 254 - three 3rd compartments + two seconds, with three blank panels instead of the two as on D216. The Real Photos number is 14188 and I’m sure it has been repro’d somewhere (but where?). In view of Mike Barrett’s suggestion I would guess the train was a special for the Open Golf game in 1936. This train looks like its on the up slow line heading towards Chester. There were slow and fast lines as far as Ledsham Junction. The two lines on the left are the West Kirby branch. The bracket signal at platform end would signal West Kirby branch, Chester slow, Chester fast, Helsby. Photo taken from the foot of Hooton South signalbox. The photograph was taken in 1931 by H.Gordon Tidey, his description being Non-stop football special from Birkenhead to Chester. The engine is no. 7691. The station is certainly Hooton. Englargement of the photograph clearly shows that the train is leaving the Up Slow line and crossing onto the West Kirby branch.